Actor Shemar Moore of the show S.W.A.T. poses with junior biology major Marisol Castorena during a break from filming on the California State University, Northridge campus. The series premieres Nov. 2 on CBS. Submitted photo by Genelyn Arante. 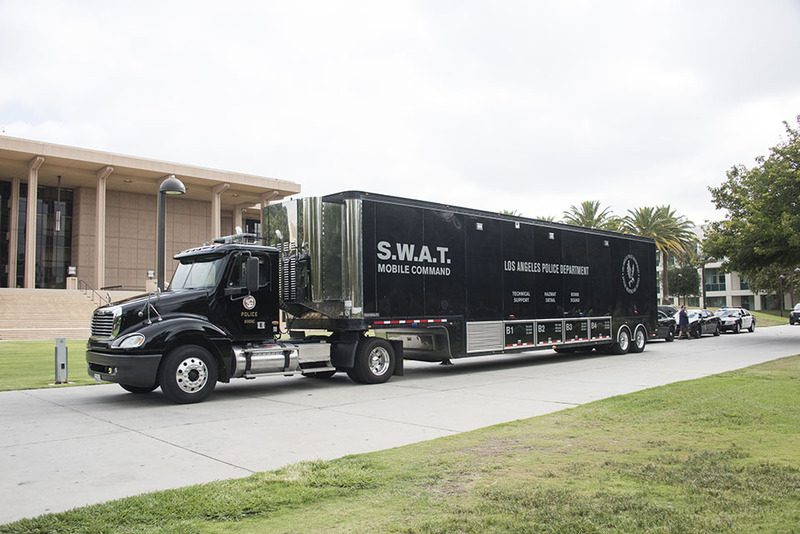 A mobile command center in front of the Delmar T. Oviatt library for a filming of the CBS drama S.W.A.T. Photo by Lee Choo. Police vehicles on the CSUN campus for a filming of the CBS drama S.W.A.T. Photo by Lee Choo. 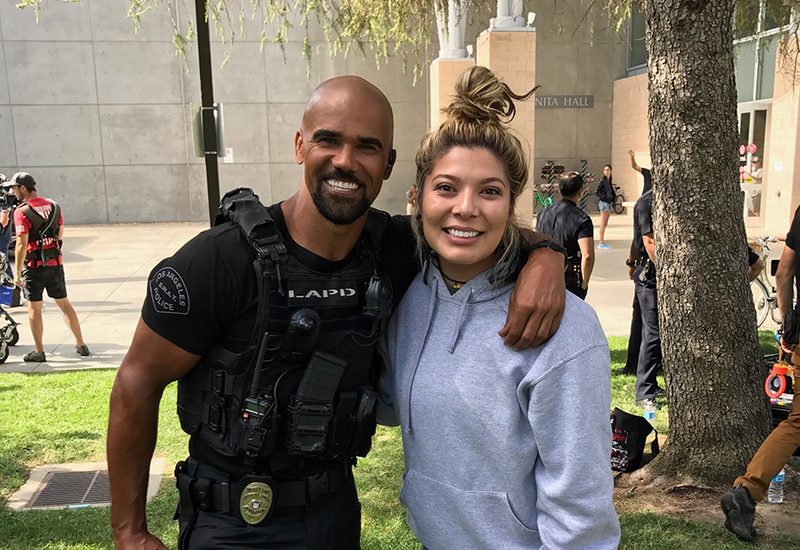 It was an intense night for Shemar Moore and the cast and crew of the upcoming CBS drama S.W.A.T. : multiple takes of the fourth episode’s tense, five-page finale. California State University, Northridge plays a starring role in the episode, including a hostage situation filmed in the Johnson Auditorium. When shooting wrapped after 10 p.m. on Aug. 17, Moore, the dreamy longtime star of Criminal Minds and The Young and the Restless who headlines S.W.A.T., which premieres Nov. 2, took a seat on a retaining wall facing the Delmar T. Oviatt Library and reflected on the day’s work. “Was that all right?” he asked a passing crew member. It’s good, it’s good, the crew member said, and by all accounts the same could be said of the three days of filming on the CSUN campus. Many members of the S.W.A.T. cast and crew praised the campus for its variety of locations and the university’s willingness to help get critical shots. CSUN is a go-to location for TV shows, feature films, music videos, commercials and commercial photo shoots. 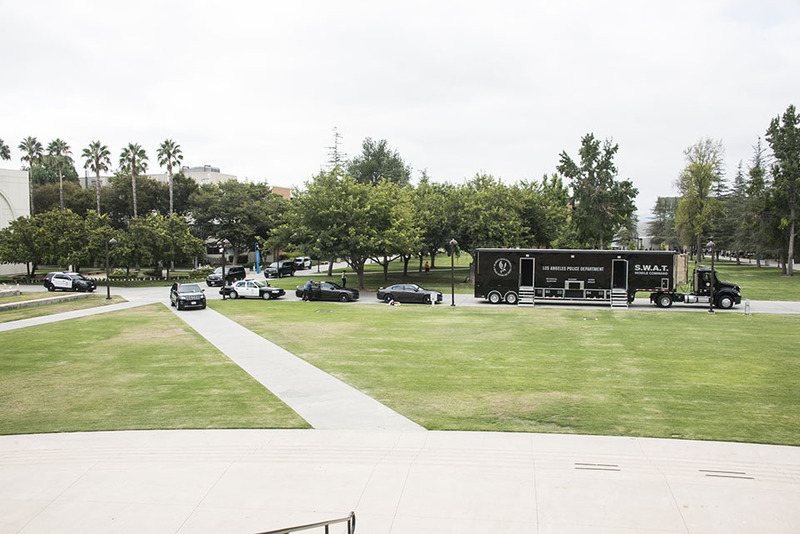 The campus recently served as a set for shows including So You Think You Can Dance, The Good Place, Lucifer, Supergirl and Adam Ruins Everything, as well as for commercials for McDonald’s, Southwest Airlines and Verizon Wireless. Nine CSUN locations stood in for fictional Camden College in the S.W.A.T. episode, Radical, which is scheduled to air at 10 p.m. Nov. 23. The production brought 100 cast and crew, plus 150 extras, some of whom were members of CSUN’s student extras program. At times, the shoot made the Sierra Quad look like a crime scene, with the flashing lights of Los Angeles Police Department cars flickering on parked armored trucks and a tractor trailer serving as a mobile command. Kent Rotherham, who wrote the episode, was pleased with the results of the night’s CSUN shoot. “It’s better than I pictured when I was writing it,” he said. ​S.W.A.T. was inspired by both a 1970s TV series and feature film of the same name. Moore stars as Daniel “Hondo” Harrelson, a Los Angeles local placed in charge of a specialized tactical unit, “torn between loyalty to where he was raised and allegiance to his brothers in blue,” according to the CBS website. The timely series explores tensions between law enforcement and the community. This exploration fueled the intensity of the scene in the Johnson Auditorium, Moore said. Soon, Moore would be shuttled back to his trailer in the B3 parking lot, his on-campus work for the episode finished. “It’s so cool to be here,” Moore said. “I don’t live that far away. Everybody’s been so cool, and the settings have been perfect for what we needed for S.W.AT. It’ll be cool for students and faculty to see their spot on the show. For more information about filming at CSUN, visit http://www.csun.edu/licensing. For information about joining CSUN’s student extras program, visit https://www.csun.edu/licensing/student-extras.